There has been a lot of hype about the different ways to parent. Not only does the discussion go significantly beyond spanking or not span king, foreign cultures are being praised for their different, more intuitive approaches. Now the question becomes does one subscribe to the Tiger Mom mentality, or the French, ‘Bringing up Bebe’ parenting style? Before answering that, we should stop and ask what ever happened to the good old American Mom? The book ‘Bringing up Bebe,’ by Pamela Druckerman, does offer much to think about. By praising the laissez-faire style of French parenting, the book in essence criticizes American parenting styles, much in the same way as ‘Battle Hymn of the Tiger Mother’. With stories lauding infants who sleep through the night by four months of age, children who dine patiently during multi-course meals, and kids who play independently at home while parents have adult time – the laid back parenting style supported by the book begins to sound attractive. The thought of being able to sit down at a playground and have a conversation with a fellow mom rather than chasing after my little sprinter (who has been complimented by strangers for his speed) struck a chord. After all, it would be nice to enjoy a bit of an adult life amidst the chaos of mommyhood. Then, I read on. As a foodie, I took to heart the discussion about how the French encourage children to eat a variety of foods. Described as a “cultivating a child’s palate,” Druckerman gives examples of how the French diversify a child’s culinary tastes. French children experience a variety of foods in not only their home but also school. In fact, there are government meetings, Commission of Menus, during which time multicourse meals are charted out and scheduled. For example, one meal would start with a salad of shredded red cabbage and yogurt, proceed with white fish with dill sauce with a side of potatoes, after which the children would enjoy brie cheese, and lastly, a baked apple for dessert–straight from the wish list of Jamie Oliver, and drastically different from the pizza and hot dogs we Americans are known for. After reading about children who enjoy fish mousse, I started to become a convert. It wasn’t until the end of the book where things got a little more interesting and, for this mama, the proffered parenting style became less attractive. Another approach was recently described by the Tiger Mom, Amy Chua, author of Battle Hymn of the Tiger Mother, who explains how children can develop their own personal inner praise. Basically by having children work hard to accomplish things, they develop an inner praise and confidence when they reach their goal. Druckerman kindly jokes about how Americans praise the smallest things like kids jumping on trampolines. Yes, I am guilty of cheering on Bobby as he jumps. What is the harm? Arguably doing so will encourage children, i.e. Bobby, to do things purely for praise. This is compared against the French model where praise is intentionally withheld. Praise is not only withheld by parents, but also doctors and teachers as well. In fact, children are to expect criticism. Now mind you, Druckerman throughout her book gives examples of French toddlers doing exceptional things. She describes in detail a three year old making yogurt cake entirely by herself – measuring ingredients, cracking eggs, and even filling muffin tins. So why not praise the cake-making child for accomplishing these things? By praising the little things are we really hindering more than helping our children? But what is the alternative? Acting indifferent to the cake making child, or criticizing the eggshell in the batter? From experience with my two-and-a-half-year-old, Bobby, I can say that that praise seems to be everything. 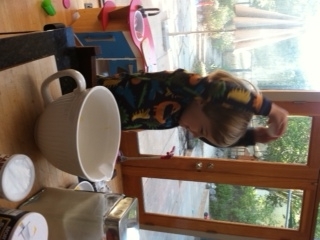 I can even see at his precious age how happy he is when he accomplishes something – when he pieces together a train track or whisks pancake batter, Bobby has a distinct smile. Often he exclaims “I did it!” With so much confidence, he tells the world about his triumph. If I were to subscribe to the French view, then I would respond by acting disinterested or pointing out that the train track isn’t quite finished. So, I had to ask myself, what is the real harm of praising his accomplishments? Where will this lead? Or the converse, where will withholding praise lead? Encouraging accomplishment whether it is putting away a toy or later getting good grades, would seem over time to encourage productive behavior. Work hard and secure good results to obtain a reward. This is a quintessential American philosophy, dating back to the Puritan culture that landed on Plymouth Rock. Maybe this is why American workers have been found as being more productive than others internationally — This is after Japan’s productivity boom of the 1980s and the recent productivity surges by Chinese and Indian workers. The question becomes what is the right amount of praise? According to Hatfield, “Experts say that the quality of praise is more important than the quantity: if praise is sincere and genuine, and focused on the effort, not the outcome, you can give it as often as your child does something that warrants a verbal reward.” The article goes on to list examples of ways to praise your kids. Giving descriptive praise – praising the effort that went into the action is singularly the best way to praise your child. It seems by praising specific efforts and actions, a parent can help their child cultivate an inner sense of confidence. So, American mamas like me are on to something. From now on, I will continue to praise Bobby’s accomplishments. I’ll be more descriptive though – be applauding Bobby’s determination in piecing those train tracks together, or the coordination and focus in whisking batter in a bowl. And, even if it’s not on the same level as making a cake from scratch, I’ll let him share his triumphant smile with the world. This entry was posted in eagle mom, parenting, tips, Uncategorized and tagged battle hymn of tiger mom, bringing up bebe, eagle mom, parenting on July 2, 2012 by Modern Mama. Recently, police reported another incident in which a strange man offered a ride to a child. It was the third or fourth such incident in recent months in Sonoma. Are children ever too young to start learning this concept? After all, I hold childhood innocence as something to be guarded, nurtured and protected. But my two and a half year old, Bobby, is quite friendly. He loves meeting friendly folks at the grocery store, in the store and around town. The recent happenings got me thinking though that maybe this is the sort of thing that I as a mom should be avoiding. Since I am in no way an expert on the subject, I consulted with a few experts. They had some great ideas. First, explain to your child in a simple way what a stranger is. A stranger is anyone who mommy and daddy do not know. And, while not all strangers are bad, strangers require ground rules. Then, explain some ground rules. Children are to ask mommy or daddy first before interacting with a stranger. This can mean just plain conversations, taking something like a gift or a treat from a stranger, or getting into a car with a stranger. Silvia Floriano the community outreach officer from our local Sherriff’s Office put it best when she said that Children normally will not yell and run at the sight of a stranger when they are under 5 since they have started to be social, especially when they are with an adult they trust. But it’s important that they learn who they can go with and who they need to stay away from when they are alone or at a distance. Especially since some kids, like Bobby, are very friendly and will talk to anyone in the grocery store. Officer Floriano reminded me of the importance of us as parents understanding that young children may not be able to understand what we are telling them. It becomes our role as parents to be patient, use simple words and be willing to repeating things over and over again. Second, introduce the concept of a stranger to your child through Play. Play is a great way to teach kids. Make a game using pictures of strangers from the web, newspapers or magazines and those of family and friends. You could even just save a few photos on your phone. Have your child pick a picture of the safe adult (family/friend) and someone they don’t know (stranger). When they do it you can reiterate the ground rules (i.e. ask mommy before taking anything from someone). Third, explain to your child the appropriate response when they are approached by a stranger. This can be a game as well. When your child is approached by a stranger they need to run back to mommy, daddy or whomever is taking care of them. They can yell, scream, kick, etc. You can make this a game as well. Role play with your child. Have them pretend someone in the family is the stranger. Then, when the stranger approaches the child, have the child run to find mommy or daddy. You can also use this to teach how to respond if they are grabbed by a stranger – i.e., kick, bite, yell, scream. Fourth, there are two other topics related to strangers that are important to introduce – secrets and appropriate touching. As Officer Floriano put it “A good secret will not make you sad or make you feel bad. Such as a birthday gift.” Whereas, “A bad secret will make you sad, scared and will make you feel bad. And can hurt you like bad touches.” Of course, it becomes important to teach children that bad secrets are not to be kept from mommy or daddy, especially if they hurt or make them feel scared or bad. Someone may tell your child that you will get upset, angry, mad when your child tells you a secret. So, you can explain to your child that you will never get mad or angry at the child for telling you a secret. Fifth, teach them about their Personal Space (the space around them that only safe people can be in) also talk to them about the Safety Circle and the Safe Area. Make it a game. Show them that they need to yell, run and tell. You can do this at the park. A child’s personal space is that surrounding them when he/she stretches out their arms. A safe area is the area that is open and makes it easy for a safe adult to see and hear the child at all times and for the adult to see and hear them. This is opposed to trees, bushes, buildings, etc., places where it is difficult for children to be seen. You can explain the concept of a safe area at a park. Have your child point out safe areas to you. This entry was posted in eagle mom, parenting, tips, Uncategorized and tagged child safety, parenting, strangers on May 22, 2012 by Modern Mama.